Have compression, have lots of gas....evidenced by the gas on the plugs when doing un-flood procedures. ie...pull plugs...clean and dry plugs , crank motor...ATF in bottom holes..re-insert plugs...etc. How do I check for spark...tried holding top front plug against block and cranking ...no spark but is this a proper way of checking?? It's possible the plugs are fouled out. 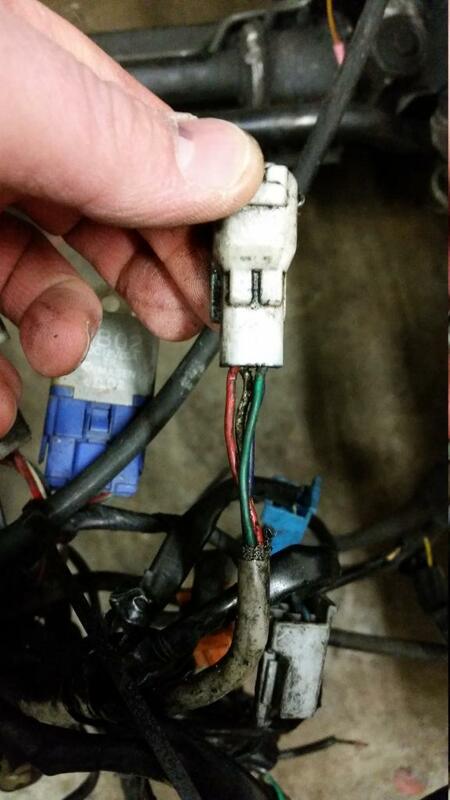 To check for spark, put a screwdriver in the plug wire and hold it about 1/8 inch from something metal. Remove the fuel pump or ecu fuse and have someone else crank the engine. If the coil is good, you will see it arc to the metal. If they are fouled, be sure to do the defloading procedure before you install new ones. Atf is not good for spark plugs. Keep us posted on progress. turns out 3 wires were broken off the connector to the CAS!!! WTF!! 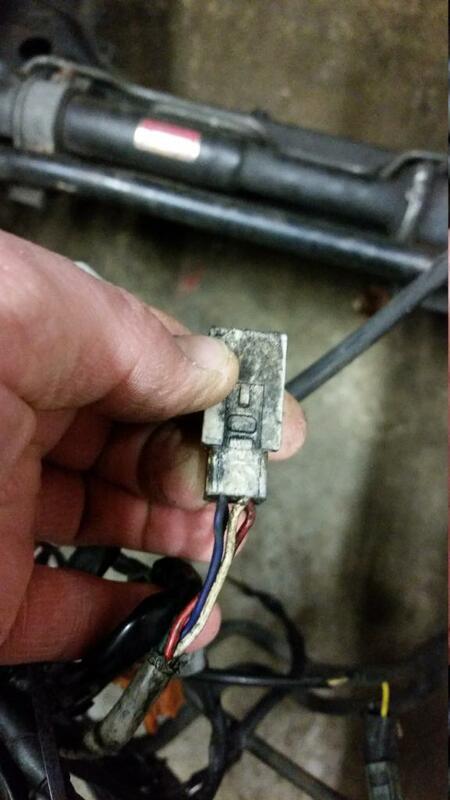 Went to take connector apart to check for resistance values as suggested by FSM and seen 3 wires off connector...repaired the connections...car started right up...imagine that!! now more issues but wil create new post. Satruday night started...drove a couple of miles and shut off...yes it was up to operating temperature..3 hours later, went to restart ...it fired once and died and now acting like no spark again.....same as when the wired on the CAS were broke off. Any one any ideas or any suggestions on how to trouble shoot this...tried looking at the FSM...HOw can I check the coils? Is there a way to check for spark other than holding wire close to block and turning over? Is there anybody with a 89 turbo that can check the wire connectors on the CAS for me. The wires from the ECU/wire harness side are red, white, green and blue...the wires on the CAS side of the connector are red, white, white / blue stripe ( I think ) and green ( I think ).....can somebody look and verify which wire connects where....when the wires broke off they broke off right at the connector and although I have the FSM I am not sure I am reading the pin-out on that connector correctly. So still havin issues I see. I have an 89 t2, but the connectors and Cas are the same for the na and turbo cars,as well as s4 and s5. My son's car is an s5 na and it's in the garage,so it'll be easy to check and post pictures for you, here in about an hour. 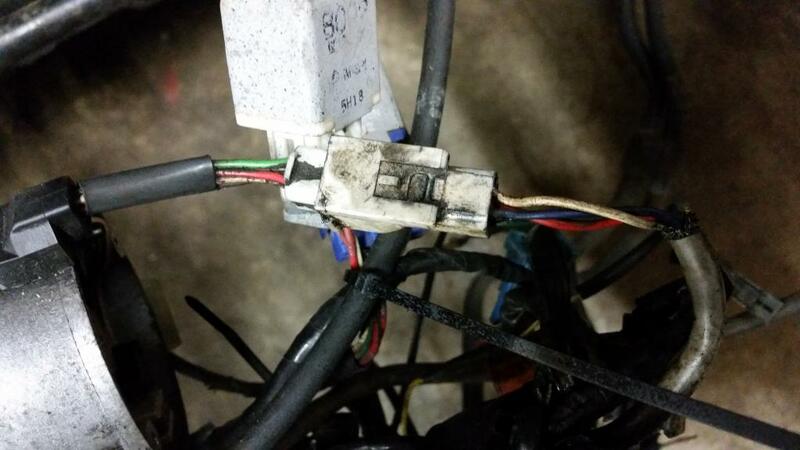 It could be a ground wire loose somewhere. I know this sounds like a stupid question,but are your battery cables in good condition? Here's pictures of the connector and connected to the cas. The 1991 wiring diagram shows red-red, white-white, blue-blue and green-green...Unless I am reading it wrong...and I probably am....being the new guy on the street here. Also the field service manual, page 32 section G shows them checking the CAS for resistance....and has a diagram of the plug that shows the colors of the harness side but not in the places that your pictures show. Unless that plug they are showing is the CAS side in which case the wire colors are wrong....I am getting a little confused here.